An artist's conception of the symbiotic star, R Aqr. Image credit: Dana Berry. Click image to enlarge. Although there are hundreds of known variable stars in the constellation of Aquarius, one of the most fascinating and well-known is the first variable to be discovered there: R Aquarii. The variability of this interesting star was first seen in the early 1800s by Karl Ludwig Harding (1765-1834). Harding, an assistant at the Johann Schoter's Observatory in Lilienthal, Germany, was originally looking for a "missing" planet between Mars and Jupiter as part of the "Celestial Police" project at the observatory. Although the elusive planet was never found, Harding did discover the third asteroid, Juno, in 1809 (Isles 1994). In addition to the minor planet finding, Harding's observations lead to the discovery of four variable stars, all of Mira-related type: R Virginis in 1809, R Aquarii in 1810, R Serpentis in 1826, and S Serpentis in 1828. All of Harding's variables are in the AAVSO observing program and all are favorites amongst many observers, but what makes R Aqr so interesting is the assorted components that make up R Aqr system and the light curve that follows. Interest in this variable has lead to over 16,000 observations of this star to be archived in the AAVSO International Database. Classed as a symbiotic variable and situated at a distance about 650 light-years (Robinson 1988), R Aqr is the closest star of its type to Earth. The first Hubble Space Telescope (HST) image of a "recent nova," R Aqr. This HST image, which was taken pre-corrective lense, shows the inner core of R Aqr resolved into two very bright knots. (The faint circular structure about the core is due to the "fog" created by spherical aberration of the HST primary.) The two knots, which appear as dark spots in the picture due to saturation, most likely harbour the double system. Also seen are filamentary features emanating from the core. Click image to enlarge. R Aquarii belongs to the symbiotic class of variables, being one of about 150 members. The symbiotic classification borrows its name from the biological word "symbiosis," whereby two different types of organisms co-exist in mutual advantage. In the astronomical sense, the symbiotic system is composed of two very different types of stars: a cool red giant star and a small hot star. Spectra of symbiotic stars suggests that there are, in fact, three regions which emit radiation. The first two being the two stellar components, while the third is that of a nebulosity that encompasses both stellar parties. The nebulosity is believed to originate from the red giant star, which loses considerable amounts of mass either through a stellar wind or through pulsation. R Aqr was originally considered to be a "regular" long-period variable until the early 1900s. 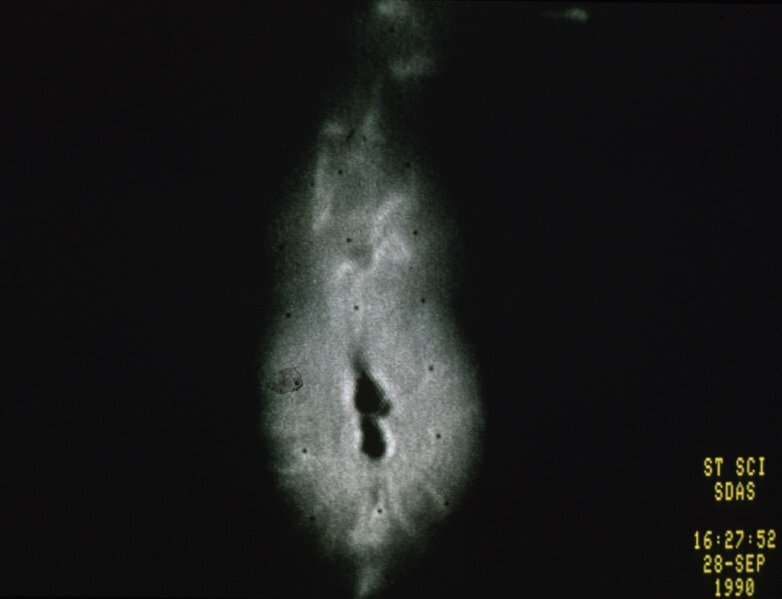 In October of 1919, a slit spectrogram of R Aqr taken at Mount Wilson Observatory showed several emission lines revealing a hot gaseous nebula in addition to the M7e spectrum of the long-period variable star. The nebulosity surrounding the stars, also known as Cederblad 211, was seen in 1921 on photographic plates taken at Lowell Observatory by Carl Lampland. In 1922, a more complex spectrum whereby three very different spectra were seen: that of the M7e star, the nebula, and a blue companion of spectral type O or B, such as a white dwarf (Mattei and Allen 1979 and references therein). In 1939, Edwin Hubble detected the expansion of the nebula and subsequent measurements of photographic plates by Walter Baade confirmed Hubble's finding. The nebulosity of R Aqr is, in fact, comprised of two distinct sections of seemingly ghostly matter: an outer region of about 2 arc minutes and an inner one of about 1 arc minute (Robinson 1988). Assuming a rate of constant expansion, it is theorized that the components of the nebula were formed 640 and 185 years ago, respectively and may be the result of a nova-like event (Robinson 1988). In addition, loops, spikes and knots have been seen in the nebula (Kaler 1982). Some of these features grow, shrink, move, and disappear altogether as the nebula is constantly changing and expanding. 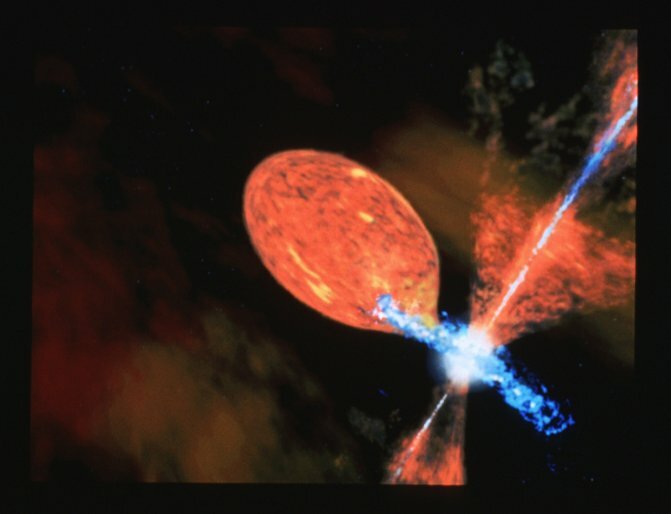 Yet another component of the R Aqr system was discovered in the 1970s when astronomers found jets of matter streaming in opposite directions. In fact, the jets of R Aqr were the first to be seen at optical wavelengths (Robinson 1986). Light curve of R Aqr taken from the AAVSO International Database. Click image to enlarge. The light curve of R Aqr is quite interesting. At first glance, the Mira star clearly dominates the light curve with its 387 day period and amplitude of over 4 magnitudes. A closer look reveals episodes of reduced amplitude. Between 1928 and 1934, the minima of the star brightened from 11th magnitude to 9th magnitude and the maxima faded from about 6th magnitude to 8th. During this time, the continous spectrum of the blue component during this time became very strong. Merrill (1940) found that the nebular lines became inconspicuous and that the hot blue star suppressed the amplitude of the long-period variable. "Normal" light variations resumed in 1934. Looking at the early light curve, it seems that such activity may have been present between 1905 and 1910, and based on early observations not archived in the AAVSO International Database, may have occurred in the 1870s and 1890s too (Mattei and Allen 1979). The star underwent a similar, but not as an extreme episode between 1974 and 1983. In addition, between 1964 and 1973, the minima were significantly brighter, and in several cycles there was a further brightening, resembling a hump in the light curve. This figure by Lee Anne Willson, Peter Garnavich, and Janet Mattei show the dips in maximum of R Aqr. Click image to enlarge. The deviation from the normal Mira light curve is believed to be the result of the white dwarf component. While the behavior of minimum light from 1974-1983 differs from that of the 1928-1934 episode, the maximum brightness was reduced by over 2 magnitudes in both instances. A theory by Willson, Garnavich, and Mattei (1981) suggest that the blue component and the accretion disk about the star are surrounded by a large, dark cloud that is not completely opaque. The dwarf, disk, and cloud move in a 44-year orbit around the system's center of mass. This is believed to be what happened around 1928 and 1978: the cloud occulted the Mira star. The team suggest that the dim maxima of R Aqr are the result of eclipses of the Mira star by a gas cloud surrounding the blue secondary. The duration of the eclipses is about eight years and occur at 44-year intervals (the longest period known!) with the most recent episode occurring between 1974 and 1983. The next eclipse is expected to begin in 2018 and end in 2026. Another theory put forth by Mikolajewska and Kenyon (1992) suggests that the interval is associated with helium-shell flashes occurring deep inside the Mira star above its degenerate core. These events would then swell the star and increase the mass-transfer rate, which in turn would brighten the white dwarf star or its accretion disk. Continued observations of this fascinating variable star will allow astronomers to piece together the mysteries that surround R Aqr. The symbiotic system R Aqr. Image credit: Anglo-Australian Observatory. Click image to enlarge. At a declination of -15 degrees, R Aqr is a good object for many northern, most southern, and all equatorially placed observers. Since R Aqr has been seen as bright as 5th magnitude and as faint as 12th magnitude, it makes for a suitable object for observers looking for variables to follow with a small telescope. In addition, this star is an excellent candidate for those interested in spectroscopic, photometric, photographic, and visual studies. For those looking to do a little planning with their observing routine, the next maximum of R Aqr is predicted to take place on August 21, 2003, this according to AAVSO Bulletin 66 (Mattei 2003). Finder charts with a comparison star sequence for R Aqr may be created using the AAVSO Variable Star Plotter (VSP). R Aqr, as well as other symbiotic stars, should be observed once a week, with the decimal portion of the Julian Date recorded to one decimal place. For those interested in a more challenging project, observers may choose to look for possible small-magnitude, short-period variability sometimes associated with the symbiotic variables. If you are interested in looking for such features, then be sure to observe every clear night and report the decimal portion of the Julian Date to 4 decimal places. Observations can them be submitted to the AAVSO for inclusion in the AAVSO International Database. Isles, J.E. "R Aquarii and Its Elusive Nebula." Sky & Telescope, October 1994, 74-75. Kaler, J.B. "R Aquarii: An Extraordinary Variable Star." Sky & Telescope, August 1982, 141-143. Mattei, J.A. and J. Allen "Variable Star Notes." Journal of the Royal Astronomical Society of Canada, 1979, Vol. 73, No. 3, 173-175. Merrill, P.W. 1940, Spectra of Long-Period Variable Stars, University of Chicago Press, Chicago, p. 84. Mikolajewsak, J and S.J. Kenyon. "On the Nova-Like Eruptions of Symbiotic Binaries." Monthly Notices of the Royal Astronomical Society, 256, 1992, 177-185. Robinson, L. "News Notes: R Aquarii's Brilliant Past." Sky and Telescope, July 1986, 30-31. Robinson, L. "News Notes: Cataclysmic Variable III: R Aquarii's Changing Look." Sky and Telescope, August 1988, 120-121. Willson, L.A., P. Garnavich, and J.A. Mattei. "The 1978 Eclipse of R Aquarii." Information Bulletin on Variable Stars, No. 1961, 1981. This month's Variable Star of the Season was prepared by Kerri Malatesta, AAVSO Technical Assistant.